1. Download Yahoo Messenger 11 and install it. 3. Next, click on the Share to button and Click on ‘Add’ next to Facebook. This will open up Facebook in your web browser. Enter your ID and pass and login. 4. Click on Allow to give access to the application. 5. 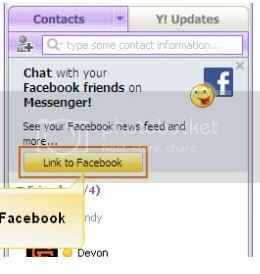 Next, a box will pop up in the Yahoo messenger stating that Facebook is now successfully linked with Yahoo IM. Click on ‘Continue’. 6. Now, you should see a new category of friends- ‘Facebook friends’ in the list of you IM. 7. To chat with Facebook friends, simply double click on a particular name and then start chatting as usual. 8. To sign out of Facebook chat you can simply go to Messenger> Sign out of Facebook chat. To sign in again, next to the Facebook friends list there is an option to sign in.